An interactive lookbook for Allude Cashmere’s showroom during Berlin Fashion Week. The studio was commissioned by a luxury cashmere brand to create a new way of showcasing their latest collection. 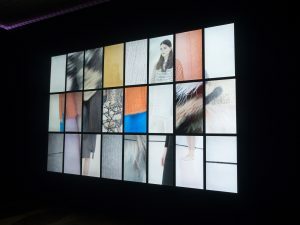 24 HD screens displayed the clothing and invited visitors to their showroom at Kronprinzenpalais to interact with the designs by pressing buttons that allowed them to view the lookbook in a variety of ways – flip through, scramble or overlay images to create a collage. 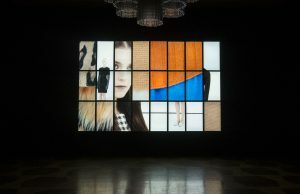 Photography for the installation was shot for the displays in Paris on a medium format high resolution Hasselblad camera. 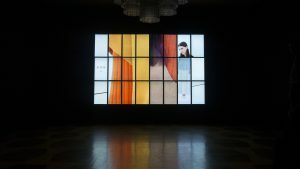 These images were then showcased through an interactive display combining four buttons, fifty million pixels, 24 Raspberry Pi computers and 24 HD screens.